Home / News / Our News is Good News! Our News is Good News! 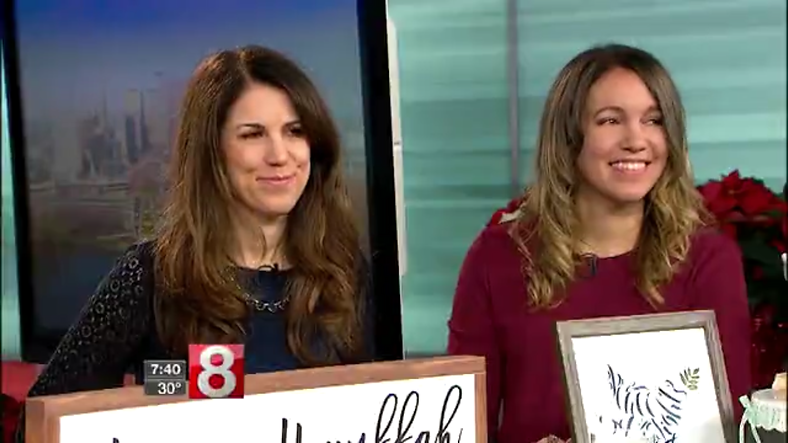 It's not everyday that we get the opportunity to be on live television, so when we were offered the chance to talk about decorating for Hanukkah on the news (Good Morning CT! ), we jumped on it! To say we were excited (and maybe a little nervous too), would be an understatement. As soon as we learned when we would be appearing, Lisa and I began to plan for our segment. Since this was a first for both of us--being in front of the camera--we had a few things to work out (What to bring! What to discuss! What to wear!). We created a list of our talking points, and we also planned which products to feature. We based this on customer favorites as well as items we thought would look best on-camera. We ended up with a great assortment that included our Chalkboard Menorah, as well as candles, signs, and pillows. Of course, we wanted to not only display our wares, but also talk about how easy it is to mix and match decorations to create beautiful spaces in the home. Once we made our final decisions (and a quick trip to the mall! ), all there was left to do was wait. On Saturday, our air date finally arrived and we drove off at the early hour of 6:00am to WTNH News 8's studio. Our on-air time was 7:45, so we spent some time trucking in our boxes, setting up our display, and then just marveling at the sheer awesomeness that is live TV. It was truly amazing just to watch the anchor, the weatherman, and the crew flit from story to story in one large, open studio. After being fitted with microphones, we were asked to stand behind our display table for a little on-air teaser shot. There's nothing quite like smiling into the camera and trying to hide some nervous laughter! After the teaser shot, the anchor, Stephanie Simoni, came over to discuss some of our talking points. The interview, she said, would be very conversational, and we could discuss our decorating tips as well as our favorite products. Within minutes, we were on the air, and Stephanie asked us some guiding questions. We shared a bit about our store, and we also discussed some decorating tips and favorite products. Stefanie asked some really thoughtful questions, and we so happy to talk about our new business! Within minutes, our segment wrapped, and we breathed a big sigh of happiness and relief! Being on live TV was certainly an exercise in thinking on our feet; it's a thrilling experience. View our video above or by clicking HERE!